A stay at Hostal Alda Palencia Plaza places you in the heart of Palencia, steps from Teatro Principal and 5 minutes by foot from Plaza Mayor. This hostal is 0.5 mi (0.9 km) from Escultura a los Comuneros and 0.5 mi (0.9 km) from San Miguel Church. Satisfy your appetite at the hotel's restaurant, which features a bar. Dining is also available at the coffee shop/café. Continental breakfasts are available daily for a fee. 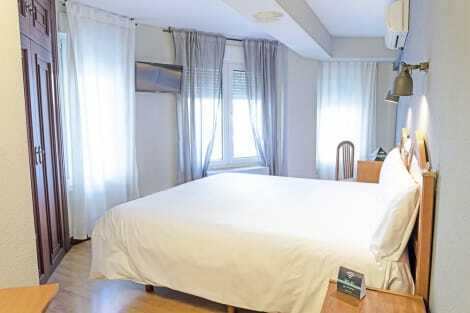 This hotel is set at the heart of Palencia, parallel to Calle Mayor. This property is situated close to the cathedral and San Miguel Tower. A number of attractions can be found within easy walking distance of the hotel. This wonderful hotel appeals to every type of traveller visiting the area. The hotel comprises elegantly-styled guest rooms, which are spacious and comfortable. The hotel offers a meeting room, for the convenience of those travelling on business. Guests are invited to enjoy a wonderful breakfast in the mornings, for a great start to the day. The hotel's 24-hour reception service ensures that guests' needs are fully met, any time of the day or night. This hotel is situated opposite the conference and exhibition centre, in Palencia. Guests will find themselves just a short journey away from the main street of the city and the bus station. The hotel's strategic location allows for ease of access to many attractions in the area, including the churches of St. Michael and St. Paul. The hotel is surrounded by many shopping, dining and entertainment opportunities. The city of Valladolid is just 4 km away from the hotel. This stylish hotel was created to provide visitors with maximum comfort and modern, functional facilities. The guest rooms have been designed with functionality and space in mind. Guests are invited to avail of the many excellent facilities and services that the hotel has to offer. Make yourself at home in one of the 69 air-conditioned rooms featuring LCD televisions. Complimentary wireless Internet access keeps you connected, and digital programming is available for your entertainment. Private bathrooms with showers feature complimentary toiletries and bidets. Conveniences include desks and complimentary bottled water, and housekeeping is provided daily. Make yourself at home in one of the 65 air-conditioned rooms featuring minibars. Complimentary wireless Internet access keeps you connected, and digital programming is available for your entertainment. Private bathrooms with shower/tub combinations feature complimentary toiletries and bidets. Conveniences include phones, as well as safes and desks. lastminute.com has a fantastic range of hotels in Palencia, with everything from cheap hotels to luxurious five star accommodation available. We like to live up to our last minute name so remember you can book any one of our excellent Palencia hotels up until midnight and stay the same night.